Today is the birthday of Jacob Grimm, who along with his brother Wilhelm Grimm, created numerous fairy tales under the name the Brothers Grimm. 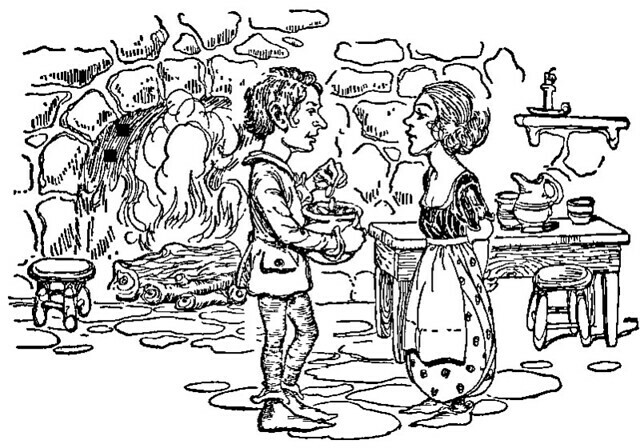 Their best known stories are classics, tales like “Cinderella,”, “The Frog Prince,” “Hansel and Gretel,” “Rapunzel,” “Rumpelstiltskin,” and “Snow White.” We usually think of these old fairy tales as being strictly for kids, probably because of how Disney and others have sanitized them, but the originals are often genuinely frightening, and their moral and purpose was to scare children, the original “scared straight” stories. In a few lesser-known stories, beer is mentioned and in a few cases is actually an important factor in the tale. Here’s a few of these Grimm’s fairy tales involving beer to read to your kids or just enjoy yourself. There was once a man who had a daughter who was called Clever Elsie. And when she had grown up her father said: ‘We will get her married.’ ‘Yes,’ said the mother, ‘if only someone would come who would have her.’ At length a man came from a distance and wooed her, who was called Hans; but he stipulated that Clever Elsie should be really smart. ‘Oh,’ said the father, ‘she has plenty of good sense’; and the mother said: ‘Oh, she can see the wind coming up the street, and hear the flies coughing.’ ‘Well,’ said Hans, ‘if she is not really smart, I won’t have her.’ When they were sitting at dinner and had eaten, the mother said: ‘Elsie, go into the cellar and fetch some beer.’ Then Clever Elsie took the pitcher from the wall, went into the cellar, and tapped the lid briskly as she went, so that the time might not appear long. When she was below she fetched herself a chair, and set it before the barrel so that she had no need to stoop, and did not hurt her back or do herself any unexpected injury. 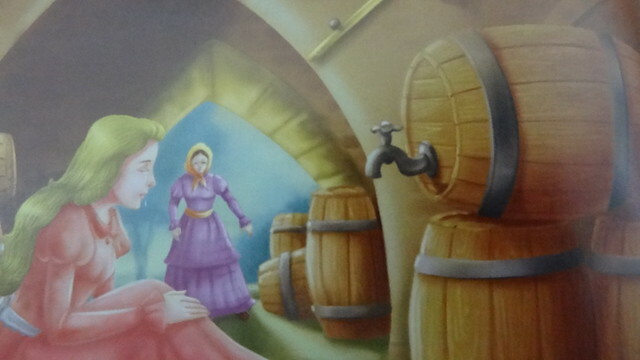 Then she placed the can before her, and turned the tap, and while the beer was running she would not let her eyes be idle, but looked up at the wall, and after much peering here and there, saw a pick-axe exactly above her, which the masons had accidentally left there. Then Clever Elsie began to weep and said: ‘If I get Hans, and we have a child, and he grows big, and we send him into the cellar here to draw beer, then the pick-axe will fall on his head and kill him.’ Then she sat and wept and screamed with all the strength of her body, over the misfortune which lay before her. Those upstairs waited for the drink, but Clever Elsie still did not come. Then the woman said to the servant: ‘Just go down into the cellar and see where Elsie is.’ The maid went and found her sitting in front of the barrel, screaming loudly. ‘Elsie why do you weep?’ asked the maid. ‘Ah,’ she answered, ‘have I not reason to weep? If I get Hans, and we have a child, and he grows big, and has to draw beer here, the pick-axe will perhaps fall on his head, and kill him.’ Then said the maid: ‘What a clever Elsie we have!’ and sat down beside her and began loudly to weep over the misfortune. After a while, as the maid did not come back, and those upstairs were thirsty for the beer, the man said to the boy: ‘Just go down into the cellar and see where Elsie and the girl are.’ The boy went down, and there sat Clever Elsie and the girl both weeping together. Then he asked: ‘Why are you weeping?’ ‘Ah,’ said Elsie, ‘have I not reason to weep? If I get Hans, and we have a child, and he grows big, and has to draw beer here, the pick-axe will fall on his head and kill him.’ Then said the boy: ‘What a clever Elsie we have!’ and sat down by her, and likewise began to howl loudly. Upstairs they waited for the boy, but as he still did not return, the man said to the woman: ‘Just go down into the cellar and see where Elsie is!’ The woman went down, and found all three in the midst of their lamentations, and inquired what was the cause; then Elsie told her also that her future child was to be killed by the pick-axe, when it grew big and had to draw beer, and the pick-axe fell down. Then said the mother likewise: ‘What a clever Elsie we have!’ and sat down and wept with them. The man upstairs waited a short time, but as his wife did not come back and his thirst grew ever greater, he said: ‘I must go into the cellar myself and see where Elsie is.’ But when he got into the cellar, and they were all sitting together crying, and he heard the reason, and that Elsie’s child was the cause, and the Elsie might perhaps bring one into the world some day, and that he might be killed by the pick-axe, if he should happen to be sitting beneath it, drawing beer just at the very time when it fell down, he cried: ‘Oh, what a clever Elsie!’ and sat down, and likewise wept with them. The bridegroom stayed upstairs alone for a long time; then as no one would come back he thought: ‘They must be waiting for me below: I too must go there and see what they are about.’ When he got down, the five of them were sitting screaming and lamenting quite piteously, each out-doing the other. ‘What misfortune has happened then?’ asked he. ‘Ah, dear Hans,’ said Elsie, ‘if we marry each other and have a child, and he is big, and we perhaps send him here to draw something to drink, then the pick-axe which has been left up there might dash his brains out if it were to fall down, so have we not reason to weep?’ ‘Come,’ said Hans, ‘more understanding than that is not needed for my household, as you are such a clever Elsie, I will have you,’ and seized her hand, took her upstairs with him, and married her. After Hans had had her some time, he said: ‘Wife, I am going out to work and earn some money for us; go into the field and cut the corn that we may have some bread.’ ‘Yes, dear Hans, I will do that.’ After Hans had gone away, she cooked herself some good broth and took it into the field with her. When she came to the field she said to herself: ‘What shall I do; shall I cut first, or shall I eat first? Oh, I will eat first.’ Then she drank her cup of broth and when she was fully satisfied, she once more said: ‘What shall I do? Shall I cut first, or shall I sleep first? I will sleep first.’ Then she lay down among the corn and fell asleep. Hans had been at home for a long time, but Elsie did not come; then said he: ‘What a clever Elsie I have; she is so industrious that she does not even come home to eat.’ But when evening came and she still stayed away, Hans went out to see what she had cut, but nothing was cut, and she was lying among the corn asleep. Then Hans hastened home and brought a fowler’s net with little bells and hung it round about her, and she still went on sleeping. Then he ran home, shut the house-door, and sat down in his chair and worked. At length, when it was quite dark, Clever Elsie awoke and when she got up there was a jingling all round about her, and the bells rang at each step which she took. Then she was alarmed, and became uncertain whether she really was Clever Elsie or not, and said: ‘Is it I, or is it not I?’ But she knew not what answer to make to this, and stood for a time in doubt; at length she thought: ‘I will go home and ask if it be I, or if it be not I, they will be sure to know.’ She ran to the door of her own house, but it was shut; then she knocked at the window and cried: ‘Hans, is Elsie within?’ ‘Yes,’ answered Hans, ‘she is within.’ Hereupon she was terrified, and said: ‘Ah, heavens! Then it is not I,’ and went to another door; but when the people heard the jingling of the bells they would not open it, and she could get in nowhere. Then she ran out of the village, and no one has seen her since. There was once a man called Frederick: he had a wife whose name was Catherine, and they had not long been married. One day Frederick said. ‘Kate! I am going to work in the fields; when I come back I shall be hungry so let me have something nice cooked, and a good draught of ale.’ ‘Very well,’ said she, ‘it shall all be ready.’ When dinner-time drew nigh, Catherine took a nice steak, which was all the meat she had, and put it on the fire to fry. The steak soon began to look brown, and to crackle in the pan; and Catherine stood by with a fork and turned it: then she said to herself, ‘The steak is almost ready, I may as well go to the cellar for the ale.’ So she left the pan on the fire and took a large jug and went into the cellar and tapped the ale cask. The beer ran into the jug and Catherine stood looking on. At last it popped into her head, ‘The dog is not shut up—he may be running away with the steak; that’s well thought of.’ So up she ran from the cellar; and sure enough the rascally cur had got the steak in his mouth, and was making off with it. Away ran Catherine, and away ran the dog across the field: but he ran faster than she, and stuck close to the steak. ‘It’s all gone, and “what can’t be cured must be endured”,’ said Catherine. So she turned round; and as she had run a good way and was tired, she walked home leisurely to cool herself. Presently she came to the top of a hill, down the side of which there was a road so narrow that the cart wheels always chafed the trees on each side as they passed. ‘Ah, see now,’ said she, ‘how they have bruised and wounded those poor trees; they will never get well.’ So she took pity on them, and made use of the butter to grease them all, so that the wheels might not hurt them so much. While she was doing this kind office one of her cheeses fell out of the basket, and rolled down the hill. Catherine looked, but could not see where it had gone; so she said, ‘Well, I suppose the other will go the same way and find you; he has younger legs than I have.’ Then she rolled the other cheese after it; and away it went, nobody knows where, down the hill. But she said she supposed that they knew the road, and would follow her, and she could not stay there all day waiting for them. At last it popped into Catherine’s head that it was the door itself that was so heavy all the time: so she whispered, ‘Frederick, I must throw the door down soon.’ But he begged and prayed her not to do so, for he was sure it would betray them. ‘Here goes, however,’ said she: and down went the door with such a clatter upon the thieves, that they cried out ‘Murder!’ and not knowing what was coming, ran away as fast as they could, and left all the gold. So when Frederick and Catherine came down, there they found all their money safe and sound. When he entered the forest he met a little grey-haired old man who bade him good day, and said: ‘Do give me a piece of cake out of your pocket, and let me have a draught of your wine; I am so hungry and thirsty.’ But the clever son answered: ‘If I give you my cake and wine, I shall have none for myself; be off with you,’ and he left the little man standing and went on. But when he began to hew down a tree, it was not long before he made a false stroke, and the axe cut him in the arm, so that he had to go home and have it bound up. And this was the little grey man’s doing. After this the second son went into the forest, and his mother gave him, like the eldest, a cake and a bottle of wine. The little old grey man met him likewise, and asked him for a piece of cake and a drink of wine. But the second son, too, said sensibly enough: ‘What I give you will be taken away from myself; be off!’ and he left the little man standing and went on. His punishment, however, was not delayed; when he had made a few blows at the tree he struck himself in the leg, so that he had to be carried home. Then Dummling said: ‘Father, do let me go and cut wood.’ The father answered: ‘Your brothers have hurt themselves with it, leave it alone, you do not understand anything about it.’ But Dummling begged so long that at last he said: ‘Just go then, you will get wiser by hurting yourself.’ His mother gave him a cake made with water and baked in the cinders, and with it a bottle of sour beer. When he came to the forest the little old grey man met him likewise, and greeting him, said: ‘Give me a piece of your cake and a drink out of your bottle; I am so hungry and thirsty.’ Dummling answered: ‘I have only cinder-cake and sour beer; if that pleases you, we will sit down and eat.’ So they sat down, and when Dummling pulled out his cinder-cake, it was a fine sweet cake, and the sour beer had become good wine. So they ate and drank, and after that the little man said: ‘Since you have a good heart, and are willing to divide what you have, I will give you good luck. There stands an old tree, cut it down, and you will find something at the roots.’ Then the little man took leave of him. The eldest thought: ‘I shall soon find an opportunity of pulling out a feather,’ and as soon as Dummling had gone out she seized the goose by the wing, but her finger and hand remained sticking fast to it. At last the third also came with the like intent, and the others screamed out: ‘Keep away; for goodness’ sake keep away!’ But she did not understand why she was to keep away. ‘The others are there,’ she thought, ‘I may as well be there too,’ and ran to them; but as soon as she had touched her sister, she remained sticking fast to her. So they had to spend the night with the goose. In the middle of the fields the parson met them, and when he saw the procession he said: ‘For shame, you good-for-nothing girls, why are you running across the fields after this young man? Is that seemly?’ At the same time he seized the youngest by the hand in order to pull her away, but as soon as he touched her he likewise stuck fast, and was himself obliged to run behind. Before long the sexton came by and saw his master, the parson, running behind three girls. He was astonished at this and called out: ‘Hi! your reverence, whither away so quickly? Do not forget that we have a christening today!’ and running after him he took him by the sleeve, but was also held fast to it. Dummling went straight into the forest, and there sat the little grey man to whom he had given his cake. When he heard what Dummling wanted, he said: ‘Since you have given me to eat and to drink, I will give you the ship; and I do all this because you once were kind to me.’ Then he gave him the ship which could sail on land and water, and when the king saw that, he could no longer prevent him from having his daughter. The wedding was celebrated, and after the king’s death, Dummling inherited his kingdom and lived for a long time contentedly with his wife. 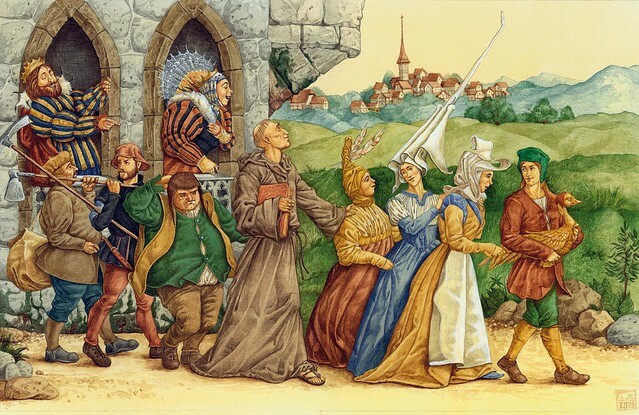 I find that the Grimm fairy tales are usually very strange and often completely confusing. It was as if all the stories were told to a 5 year old, then someone gave the kid 3 Red Bulls and then asked him to repeat the stories! But the question remains: Did Elsie’s son die from the pick axe? Did she lose all of her sons to the pick axe, or just one? Why are daughters magically protected from the pick axe?